Thank you Koen, coming from one the most experienced in this field of charcoal gasification means a lot to me. 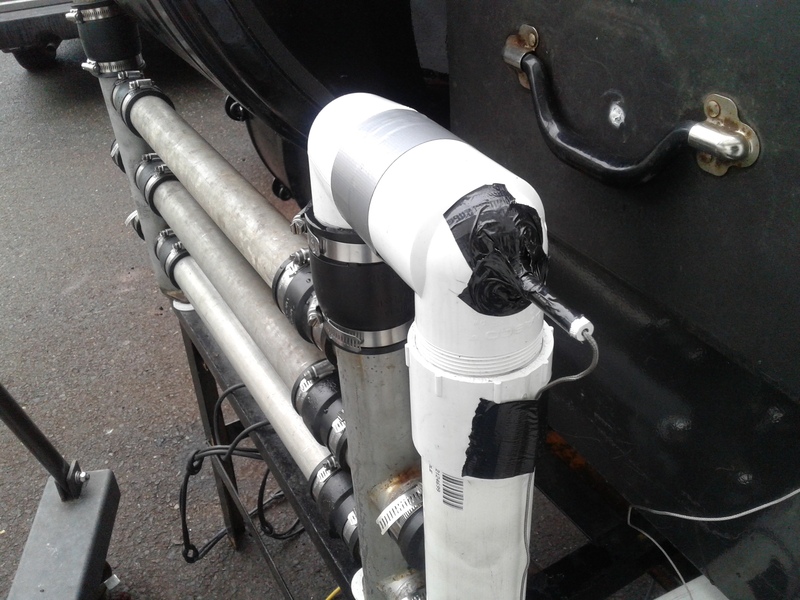 I am hoping this nozzle design will be a new break through for charcoal gasification, it seems that there is nothing new under the sun anymore everything has been tried. Even if it has been tried before and it worked, but was lost and forgot about, I will be happy and honored to have found it again for us all. I think I like experimenting as much as driving on wood. It is fun. This Idea of soaking the insulation in sodium silicate makes me wonder. The tiny pockets of air are what give the insulative quality to the insulation. would not soaking it with hardener negate this? I guess you are not really soaking it all the way through, just a shell, so it’s ok.
Andy, this was my concern too thats why l only soaked the surface. But further testing showed rapid heating of moist waterglass makes it popp like a popcorn createing the air pockets so next time l will soak it all. Amazing Bob that you could design and build such a technically new style gasifier and have it work pretty well first time. As I read through the post and saw all the plumbing you put it, I got to thinking this guy must have been a juggler in the circus in an earlier life. All those valves to control; PLUS the air mix and throttle when it is hooked up to an engine. Then as I watched the video of the start up, it appears that you are only using those valves for shut offs. The throttle you even opened to wide open with a stick. What I’m getting at is; doesn’t the engine vacuum control the air going to the gasifier?? My blue tooth temperature probes device came today. $29.00 on Amazon. Made by Cappec. 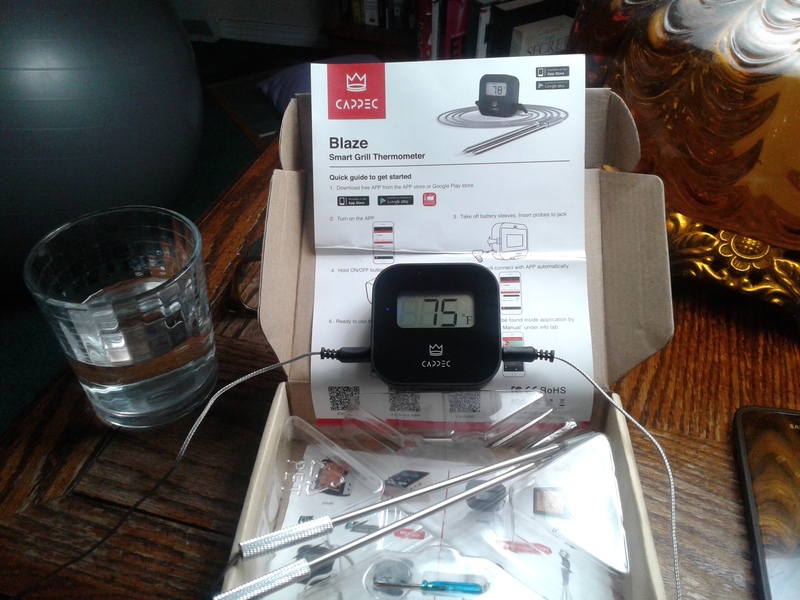 Blaze smart grill thermometer. They make a more expensive device, but I thought I would try out the less expensive unit first. If it doesn’t work for my purpose on the gasifier then it will work on my barbeque grill for cooking meats. I will keep everyone posted. It has a free app. for my phone and pad. More on it later. It is starting to snow again, might be shoveling again tomorrow. Getting lots of charco gasification Idea plans now.keep on posting your results its all learning in new designs, Thanks. PS were getting freezing rain here. Also the blast of the 3/4" nozzle will help keep the hot char away from the nozzles opening, that is the fire brick 2" nozzle hole with ceramic insulation in front of it while the engine is idling. Both nozzle are working at the same time, but each one has a variable flow by the controling of the throttle body air intake plate. Well that is the plan anyways. Hope it works. No likely the freezing rain, we just had a few days of it. Drive safe my friend. Yup It’s all new territory for me too. Every day I am learning new things on DOW threads from everyone. It is so great we have this wonderful DOW forum to learn from, the people covering all over the face of this earth. 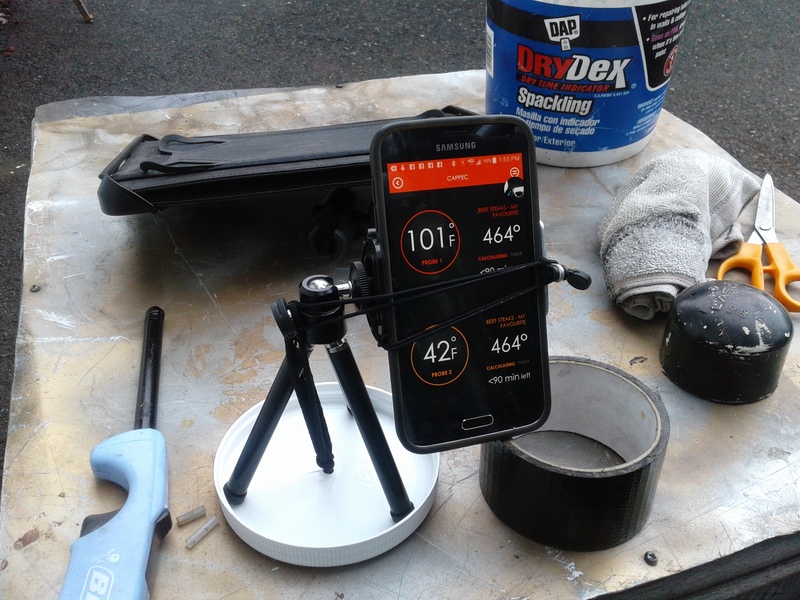 just keep in mind that coating your heavy duty metal piece can protect it from burning away due to contact with oxygen, but can’t protect it from the heat. If it gets too hot it still can bend or even melt. The problem with charcoal gasifiers without a grate is that the ash and slag accumulates in the reaction zone close to the nozzle. If there is too much ash, the reaction zone is forced upwards in the direction of the hopper. So it is necessary to clean the hearth zone from time to time. I think @KristijanL is facing something similar with his gasifier at the moment. @glgilmore also explained that at Kristijan’s Merceds-thread. It was recommended for the cross-draft Gohin-Poulenc-gasifier to clean the hearth every day if in continuous service. They had a special plate to block the fuel flow from the hopper to the hearth, so you could do the cleaning with a full hopper. There are some graphs how the reaction zone in a cross-draft gasifier moves with accumulating ash in the book from Switzerland. Unfortunately it seems that Chris found no time so far to upload it. I will try to find it and post it later. Thanks Til, that would be great to read through the book from Switzerland. Feel free to post a link here. . In my design in the hearth zone at the end is the drop box plate that flips up and I have a charcoal blocking plate that slides in place to stop the char from flowing down from the hopper for cleaning out the hearth area, haven’t need to use it yet with the hopper not being filled to full capacity. I have read some where about the Gohin-Poulenc-gasifier clean out blocking plate. Also on the grateless cross-draft I design I put a curved plate in the bottom to hopefully have the ash get trapped in the lower part on each side using the high velocity air pass over the top of the plate when the 3/4" nozzle is working, clearing the char and ash from the 2" nozzle opening. If I can get a few operating days, before cleaning It out my goal will have been met in this area. 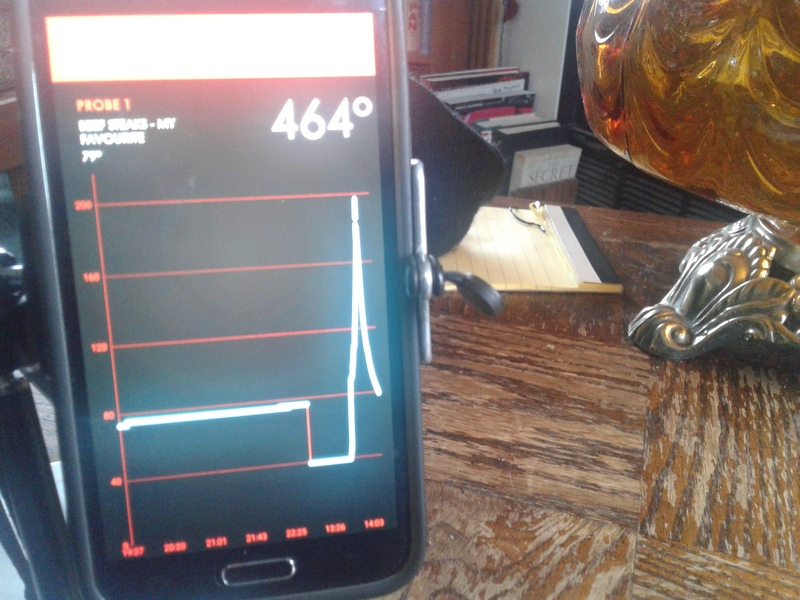 Thanks again for you and everyone else’s help and support, in this gasifier build it is very much appreciated. I only have a pdf-scan of the book and already sent it to Chris. No link, unfortunately. But I promised to show you graphs of the moving reaction zone, when the slag and ash builds up. Maybe also interesting for you, @KristijanL. The black piece is the piece of slag in the last 6.phase, when operation and lighting becomes nearly impossible. Another drawing which shows where slag may form. Here, the cross-darft slag formation is opposite, due to the deeper hearth zone under the nozzle. If there are any detailed questions about this graphs, pleased ask. Thank you, I have never seen this before. Very interesting. After looking the pictures over, the first one is more like my gasifier. The nozzle is almost flush and there is the heavy plate above the nozzle. The gas travels across and down to the bottom and then up the drop box and out. There are no holes for gas to go up or straight across. I hope this 35 to 40 degree gas flow angle will help to prevent the stage 4,5,6 from happening, also the plate above. I definitely feel that I am breaking new ground here, and it is exciting to be doing this. Today I have hooked my temperature probes. Probe 1 just after the cooling rails. Probe 2 monitoring the upper part of the hopper. 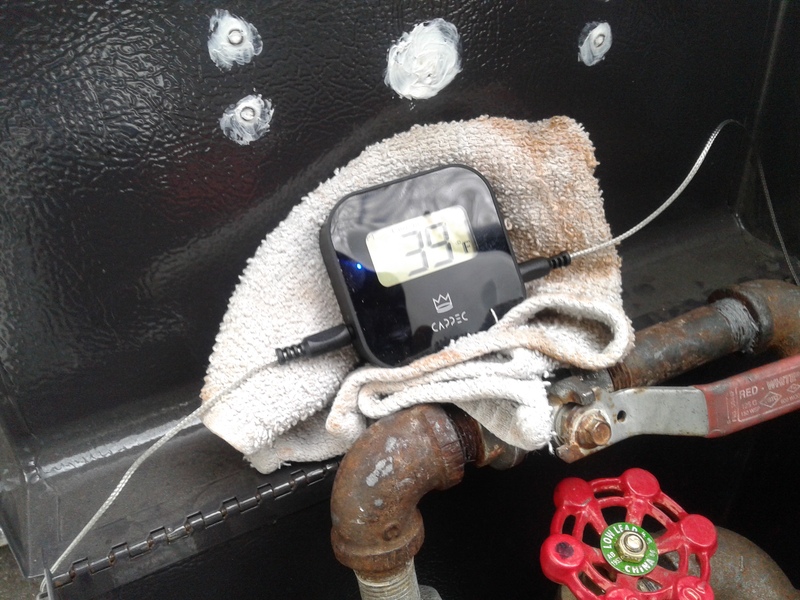 The blue tooth works great and the probes plug in and out on the black box. Test #3 is going to be different then I was going to do. I looked at the charcoal that got a little of the freezing rain on it. Yup you guessed it it when on top of my drier charcoal. Just curious how the more moist batch will do. I was amazed by how dry that batch of charcoal felt. well, as far is I understand the stage 4,5 and 6 just happen if you refuse to clean your hearth ;-). After which time do you have to clean it, time will tell you. Just had a look on your photos of emptying your gasifier after the test run and noticed there is some ash close to your nozzle. This will add up during operation. Yes, charcoal can absorp a lot of water before it starts to feel wet at the touch. If it doesn’t ring anymore, it’s quite wet. 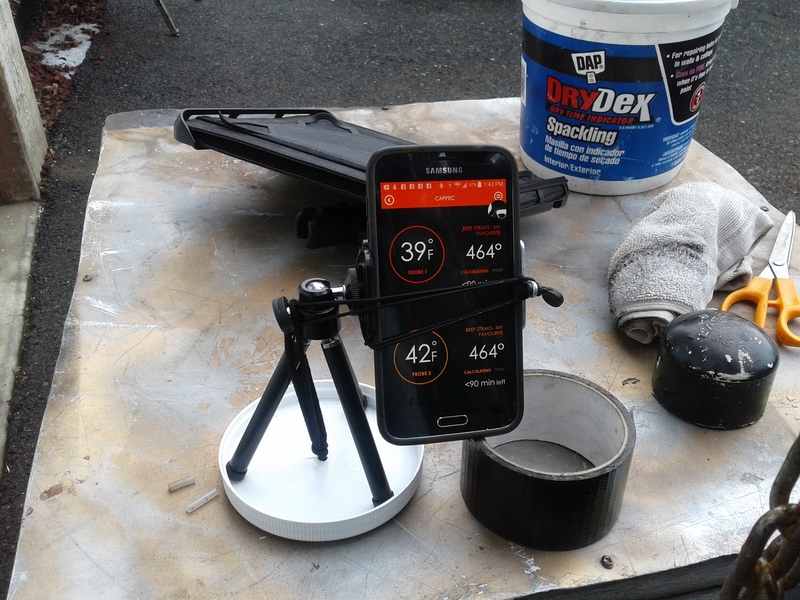 Test run #3 stage #1 went well, I did in 2 stages fired it up had a flare in 3 to 4 mins. Checked the probes out they work great on my phone or pad. The black box with read out flashes back and forth from probe 1 to probe 2 readings. 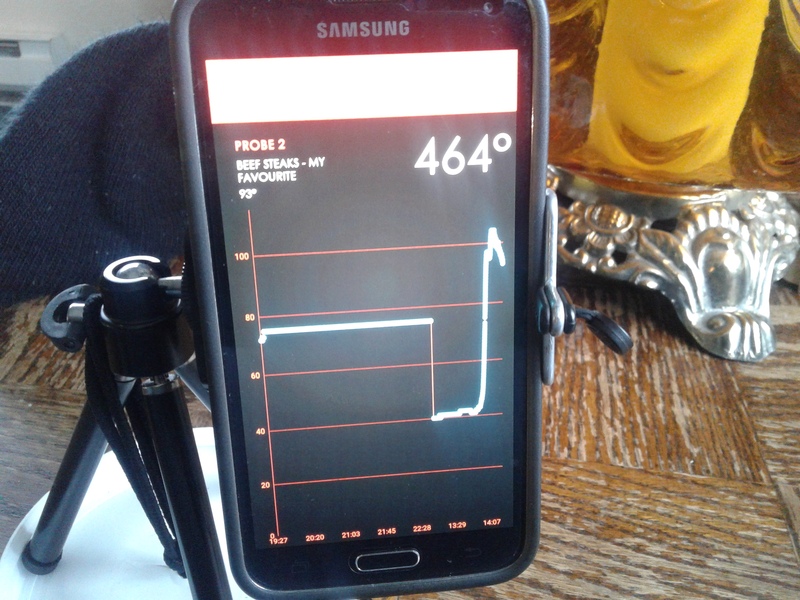 On the phone or pad screen you can select temperature read out of both or a graph screen of one or the other probe. Here some pictures. What is nice about using my pad or phone is, I can save the graphs using a screen shot and save it. After about 15 minutes I shut it down the truck, turned the suction blower off, and closed the 3 valves and walked away. Came back in 1 1/2 hours open the 3 valves, turn on the suction blower, and started the truck, had a flare in less then 2 minutes. Stage #2 it was time to crank it up, I set the suction blower at full throttle. Had a big flare coming out of the flare tube. 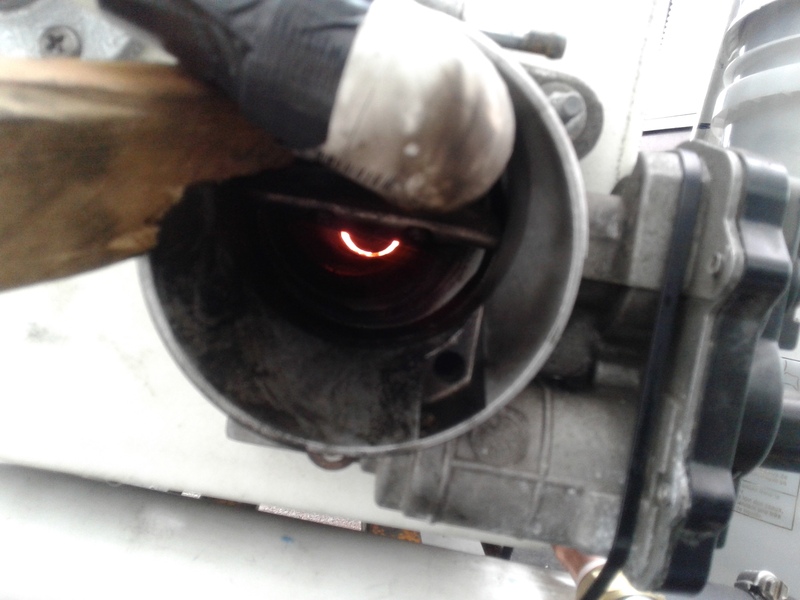 Run it hard for 16 minutes and it started to heat up, air coming into tho filter over 200f . 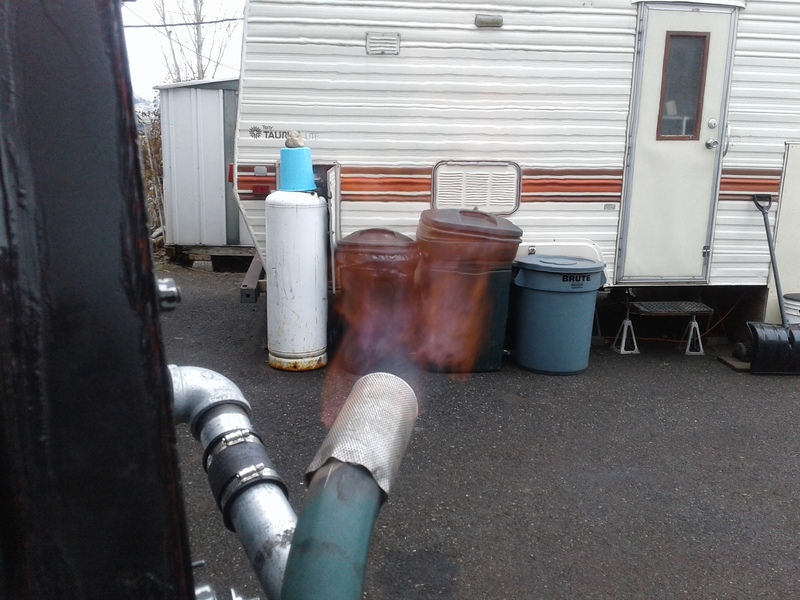 Gas coming out of the gasifier drop box. 485f . Time to shut it down. Hopper warm , lower barrow 250f at the top where connected to the hopper. When putting the charcoal back into the gasifier I put all the course popcorn size in first, and in the hopper all the smaller stuff. Tomorrow when I do a inspection it be interesting what I will find. My plastic buckets filter were pushed to there limits, would not want to go any hotter then 180f continuous running. Summer time driving not going to happen. So it looks like metal buckets are in order here. And metal piping to the filter. I will still run the filter to get all the bugs out before building the metal buckets filter. Bob i bet you could use those plastic filters on a wood gas small car unit after the cooling rails.? Or do you think they wood be big enough for the dakota dow. 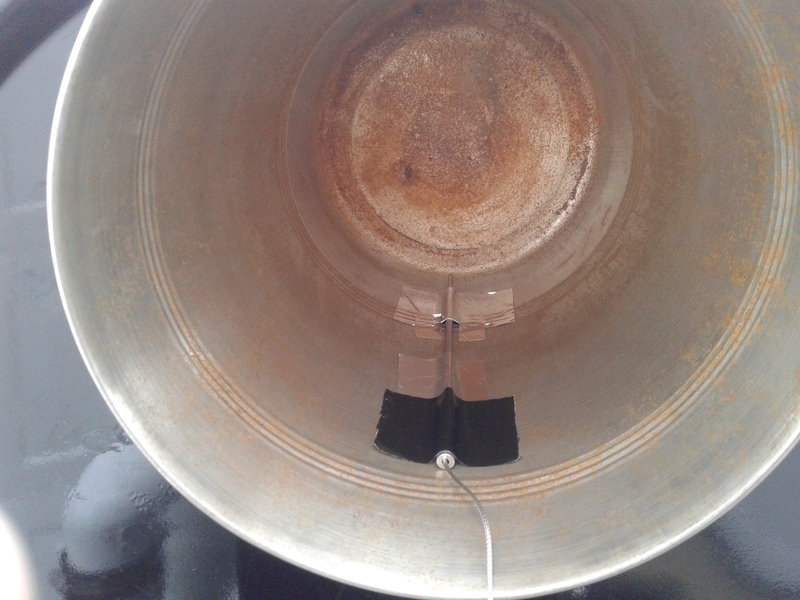 The plastic buckets sock filter will work great on my simple fire that I am also building for my motor home 4 kw genset, if I can’t use it on this gasifier. It will not go the the junk pile that’s for sure. The vacuum cleaner blower that I use can really put out a Big flare of fire. I am not sure yet how much the engine will pull in volume of gas when driving. I like this concept that @KristijanL has come up with when driving his car. I have very similar terrain to drive where I live. Let the car start and idle on dino fuel, run on charcoal fuel at lower/medium speeds to a point, use dino fuel for going up hills and passing other cars ECT. Like @Wayne said Don’t Be A Purist when it comes to DOW. Or Charcoal. Always learning new things here on DOW. Thanks Bob i like the word purist , but its more fun giving it the wood instead of giving it the petro foot pedal too the floor.YEEE HAA. I would like too build a gary gilmore simple fire for generator too. Lord willing as we Should Say.